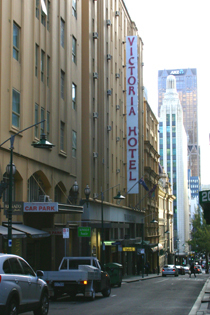 The Victoria Hotel Melbourne is an affordable 3 ½ star hotel right in the heart of the CBD. It combines late 1800s grandeur with contemporary comfort, and is located in Little Collins Street amidst great shopping and entertainment. As one of the original Melbourne hotels, it opened in November 1880 under the name of Victoria Coffee Palace - a dry hotel: no alcohol, but Beef Tea, mineral water and coffee - but with a Smoking Room. It was the first Melbourne hotel with electric lights in its rooms. The Vic was a luxury hotel in the 20s and 30s and had porters meet you at Spencer Street Railway Station or at your overseas liner in Port Melbourne. During W.W.II it was occupied by the American Army. Then it was used during the 1956 Melbourne Olympics for IOC banquets, and in 2006 the Victoria Hotel housed Australian officials for the Commonwealth Games. Today, it is a hotel with character and modern facilities  with an indoor pool, spa, sauna and gym overlooking the Melbourne city, high speed internet, and a value for money Restaurant and bar. For guaranteed best prices, you can book the Victoria Hotel here through secure bookings by Booking.com - No Reservation Fees! From the Victoria Hotel, located right behind Melbourne Town Hall, you have easy access to the Princess Theatre, Bourke Street Mall and Federation Square. The Arts and Sporting precincts along the Yarra are all within walking distance. There are trams along Swanston Street, which will connect you with the Melbourne tram network that can take you pretty much anywhere. Prices for cheap Hotels Melbourne vary according to the season and Melbourne events. Booking over the internet will give you a discounted rate. You can make a booking for good deals and last minute hotels Melbourne here.